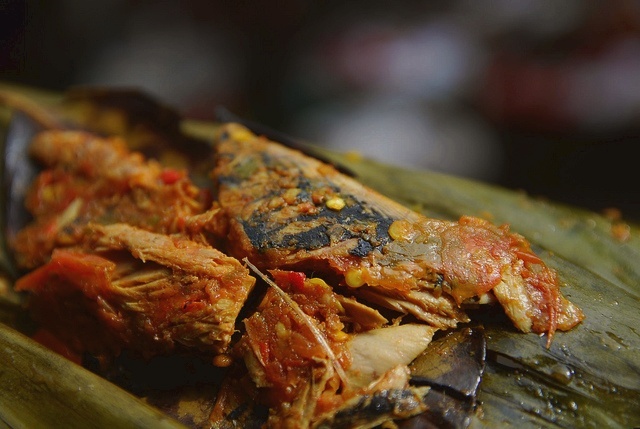 A slightly less risky snack of cooked fish, wrapped with pounded ingredients and grilled in a banana leaf parcel. Looks good, smells great, but wasn't anything special. Simple Singapore food. Wash and clean fish. Drain. In a mortar, pound chillies, shallots, garlic, turmeric, ginger, lemon grass, galangal to a fine paste. Keep aside. In a medium bowl, combine pounded ingredients, grated coconut and salt. Mix well and coat each fish with the mixture. Wrap each fish in banana leaf. Place in oven and bake (or grill over a charcoal fire) for 30 minutes, turning over once or twice during baking.